This does certainly NOT follow from the summary, and very very likely also not from the study cited. In the present study, the effects on oxidative balance and cellular end points of glyphosate, aminomethylphosphonic acid (AMPA), and a glyphosate formulation (G formulation) were examined in HepG2 cell line, at dilution levels far below agricultural recommendations. Our results show that G formulation had toxic effects while no effects were found with acid glyphosate and AMPA treatments. Glyphosate formulation exposure produced an increase in reactive oxygen species, nitrotyrosine formation, superoxide dismutase activity, and glutathione (GSH) levels, while no effects were observed for catalase and GSH-S-transferase activities. Also, G formulation triggered caspase 3/7 activation and hence induced apoptosis pathway in this cell line. Aminomethylphosphonic acid exposure produced an increase in GSH levels while no differences were observed in other antioxidant parameters. No effects were observed when the cells were exposed to acid glyphosate. These results confirm that G formulations have adjuvants working together with the active ingredient and causing toxic effects that are not seen with acid glyphosate. As Bill Maher said, we don't have to worry about ISIS - Monsanto products will kill us all first. Argentina has sued Monsanto for its toxic, cancer causing chemicals and GMO, but if you want to be able to sue Monsanto for their dastardly deeds, you better speak up. It is becoming nearly impossible to sue the company in the US, and legal action is just one way of taking down this eugenically motivated monster. Arielle, You apperently don't know much about roundup.... I think you are getting roundup mixed up with aspertame... Roundup is technically safer than aspertame. 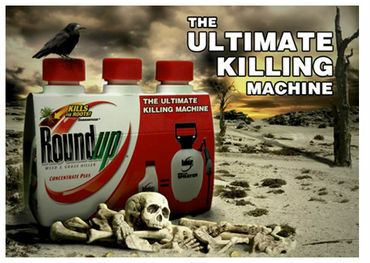 Roundup DOES NOT kill any insects. it is applied according to the label on crops that tolerate roundup to kill weeds within the crop only. It does not leech into the ground, it is rapidly broken down by soil microbes since it is salt based. Roundup is much safer to handle and apply than any conventional herbicide, I have used many kinds, so i do know. Noted. I believe it along with other chemicals will eventually lead to the extinction of mankind. I believe our government is too close to the chemical companies. "The US Environmental Protection Agency (EPA) has raised the permitted tolerance levels of glyphosate residue�the controversial herbicide and active ingredient in Monsanto�s Round Up�in many of the fruits and vegetables that you eat. The new regulation raises glyphosate levels in oilseed crops, which include sesame, flax, and soybean, from 20 parts per million (ppm), to 40 ppm. It also raises the allowable glyphosate contamination level for sweet potatoes and carrots from 0.2 ppm to 3 ppm for sweet potatoes and 5ppm for carrots, that�s 15 and 25 times the previous levels. The change in tolerance levels affects several other agricultural products, including animal feed, root crops and fruit trees." Well said, Julie. And, even if you are avoiding Round Up and other synthetic pesticides, you are still getting a dose of so-called "natural" pesticides commonly used by most organic farmers. The organic label doesn't make these pesticides any safer than calling them natural does. If roundup is that toxic i would have been dead 17 years ago when i got a splash on my bare arm... Roundup is one of the safest herbicides to handle and use. yes it has splashed on me yearly the past 17 years, yes it does taste salty, just got to spit it out, drink some water. if on skin wash off with water. Not many pesticides you can do that with. Some burn, some need immidiate attention, some cause rashes, some you absolutely do not want to get in the eyes. There is 3 warning labels on pesticides, roundup is the lowest. the other 2 levels are in a whole league of their own, the top one skull, crossbones. what people spray on their yards, flowers is more toxic than roundup, same goes for RAID. In a crapshoot, roundup is safer than many mosquito deterrents you put on your skin. I guess my dad needs to stop spraying it like water then. Well, Krista, true, no chemicals totally safe. but then driving is not safe. eating out is not always safe. walking downs stairs is not always safe. Overall, what is safe?? Every farmer works with a hazard every day no matter what they do, pesticides of some kind are a tool that is available when needed each and every year. Can we be certain, that Monsanto is run by 'real' human beings? I think they are real human beings. Just not very nice ones.